Originally founded as a die casting company, who then developed into the manufacture of locks for the motor industry, which they were able to do because of their expertise in producing the intricate die-castings required for these locks. ALBERT MARSTON AND CO. LTD. WELLINGTON WORKS, NORTH STREET, WOLVERHAMPTON. 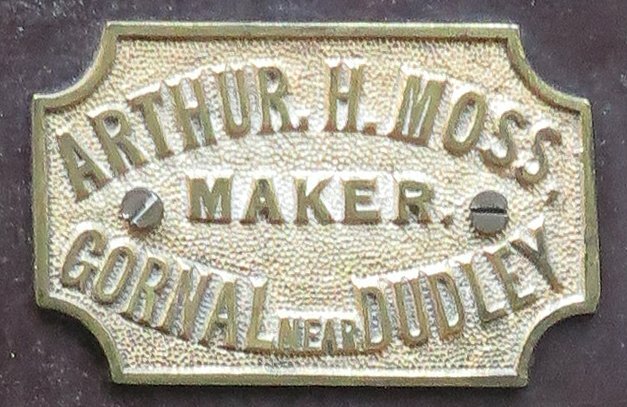 Albert Marston and Co had their beginning as a brass foundry started by Albert Marston in the 1880s in Wellington Works, Cemetery Road, Willenhall. They expanded to make cabinet and brass padlocks and the foundry became restricted to meet "in house" needs. In trade directories of 1914 and 1921 they are listed as lockmakers. In 1921 Albert Marston retired and sold the business to Samuel Percy Bryan, who had been a director if H & T. Vaughan but had left when they were taken over by Yale and Towne Manufacturing Co. (q.v.). Other directors were Bertram Cope, who married a daughter of Mr Graham, the proprietor of the Express and Star newspaper, and Enoch Pinson. The company was re-established as a limited company. Production expanded to manufacture a wider range of locks and associated hardware including motor and ships locks. 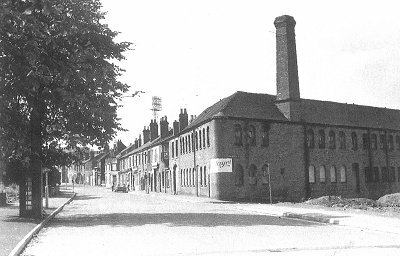 In 1924 they purchased premises in North Street, Wolverhampton (right) and expanded the parts they made for the flourishing Wolverhampton car industry supplying Star, Clyno, etc. with door locks, fittings and window trims. 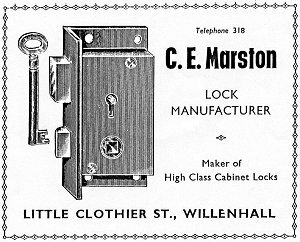 Decline in trade during the recession lead to the closure of the Willenhall works and foundry in 1927 and business was concentrated more on the manufacture of door locks, including stock locks and lever cylinder night latches. Their Wellington five lever cylinder lock, introduced in 1928, was their answer to the cylinder pin tumbler lock that had becoming popular in the early part of the 1900s. They manufactured locks under the WELLINGTON, TRAFALGAR and WATERLOO trademarks. During the Second World War lock manufacture virtually ceased, being replaced by munitions manufacture. Lock-making recommenced in difficult conditions caused by the shortage of raw materials in 1946. In 1951, on the retirement of Percy Bryan, Harry (Bill) Williams purchased a controlling interest in the company. Bill had joined Albert Marston as a trainee in 1936 whilst studying for his Institute of Production Engineers membership and, after war service in the Army between 1939 and 1945, he returned as assistant works manager, eventually becoming Managing Director on the retirement of Percy Bryan. Bill’s efforts were concentrated on new and innovative designs, including door furniture and window fittings, which were introduced in 1956. Marketing efforts were directed in seeking specification by the major housing authorities, the London County Council becoming their biggest customer. By 1969 profitable trading lead to an increased interest in acquiring the company from several public companies and eventually, in 1971, the shareholders accepted an offer from the Chubb group. Bill Williams became a director of the new Chubb Group of lock companies, until he retired in 1983. Graham Davies, previously the company secretary and then financial director, became chief executive. Also at this point the company became more closely associated with Josiah Parkes, who were also members of the Chubb group. The company still operated independently until 1992, when it was merged completely into Josiah Parkes, the Neachells Lane works were closed and all Marston production moved to the Josiah Parkes works in Portobello Willenhall. There they maintained the manufacture of many items of the Marston range. In 1998, after the merger of the Chubb Group with Yale, following their acquisition by Williams Holdings, production was rationalised in the Portobello works under the Yale Chubb Union brands, with only a few of the specialised Marston range of locks still being produced. Iron padlock makers. In 1921 there was an Edwin Marston at 27b Bloxwich Road Willenhall. Existing in 1936 and 1953. Not existing in 1970. Nothing else known. Cabinet and padlock makers. Existing in 1921 at Temple Bar; and in 1936 and 1953 at Little Clothier Street. An undated advert. Courtesy of Trevor Dowson. There was a Charles Mason senior at Wolverhampton Road, Wednesfield in 1888. In about 1959 the firm was being run by Mrs Mason. They did not produce anything but had somehow obtained an order to supply Basta Ltd, of Tubbercurry, Co Sligo, Ireland (qv) with double hand rim lock keys. Mrs Mason had them made by Arthur Hough and Sons Ltd (qv). This arrangement lasted until about 1962 when Basta approached Arthur Hough and Sons and cut out Mrs Mason. After this the business closed. Established in 1865. Paperwork of the 1920s showed the proprietor as S.E Mattox, but this was crossed out and changed to J Onions. He was the proprietor in 1937, when their main customers were Fletcher Hardware Ltd., F Jeavons and Co. Ltd. and the Anglo Finnish Hardware Company Ltd. They purchasing key castings from J Guest and Goodwin foundries. It would appear that in 1940, when it became difficult to obtain key castings, they started to refurbish pumps for the Boulton Paul Aircraft Company. The pumps had been purchased from Hattersley & Davidson Ltd. They were still supplying keys to Fletcher Hardware and F. Jeavons in 1942 although the quantities were reduced. Later letter headings showed air and fluid pumps and aircraft devices, as well as keys. After the war they moved into repairing radios and televisions. They were not listed as keymakers in the Kelly’s directory of 1953. Key makers. The firm was founded by John Mattox, who started making keys in a shed close to the Bull Ring, Wood End Road, Wednesfield, in 1850. He moved with his family to Amos Lane about 1850 and built Colonial works. He died in 1889 age 63. His daughter Polly had married a key smith who worked for the family business, Herbert Hughes. In 1928 their son, Bernard Thomas Hughes, inherited the business with two partners, Mary Elisabeth Mattox and Sibylla Susannah Cooper. The running of the business was left to Bernard. His two sons Leslie and Gerald join him as key smiths in around 1960. Apart from the fitting of garage doors in the 1930s, the building, that still retained its original arched metal framed windows, remained the same when it was put up for sale in April 1998. The ground floor was used as the stores, with the upper floor used as the workshop. The Hughes family built up the business supplying keys not only to the home market but they also had large export business to New Zealand, Kenya, India, Tasmania, South Africa and Australia, even at one time supplying to the West Indies and South America. 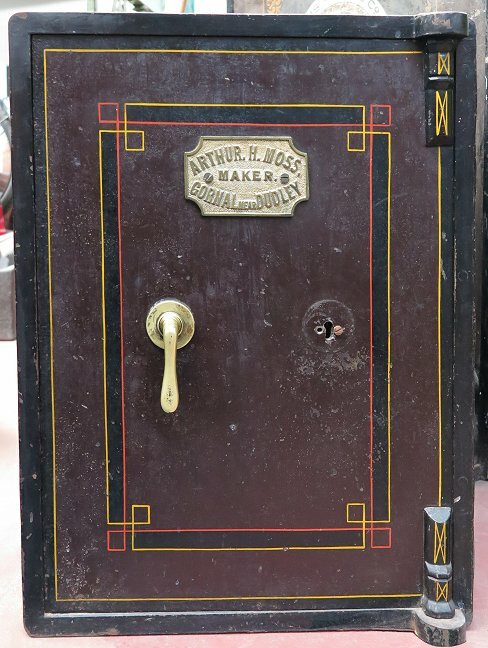 Many locksmiths in Willenhall used their keys: Anglo-American Lock Co, Lowe and Fletcher Ltd., David Beards, John Waine and Sons; and they also supplied direct to the railways and factors and agents. In the early 1960s the welded steel key became the cheapest means of producing keys and their industry changed. With the demise of the need to work on cast keys, they concentrated on cutting keys and repairing old locks, especially for churches and stately homes, as well as the general public. Between 1960 and 1980 they purchased many special lines of welded steel keys and blanks for export to Australia and South Africa from Arthur Hough. MET-PRO (HARDWARE) LIMITED, LOWER LICHFIELD STREET, WILLENHALL. The firm was trading in the mid 1950s. Nothing else known. JOSEPH MILLINCAMP, 5 HALL STREET, WEDNESFIELD. Key maker. 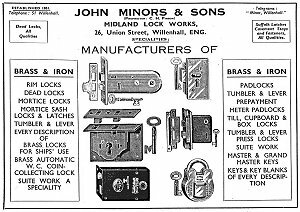 In 1921 Joseph Millincamp was a keymaker at Rookery Street Wednesfield and William Millincamp was making keys at 21 Hall Street Wednesfield. Nothing else known. ENOCH MILLINGTON AND SONS, 95 NEW HALL STREET, WILLENHALL. Mortice and rim lock makers. Existing in 1914 and 1953. Not existing in 1970. Nothing else known. JOHN MINORS, 26 UNION STREET, WILLENHALL. The firm was founded in 1801. In the 1881 census Dennis Minors, aged 36, living at 18 Cemetery Road, is classed as a lockmaker. He had a son, also Dennis. They employed 10 men, 3 boys and 3 women. They patented the Scandinavian type padlock in 1886 and also made swivel padlocks, barge padlocks, trunk locks, cupboard and till locks. The advert on the left is from Peck's trade directory of 1896. Later John and Dennis Minors were partners and traded as John Minors, until 1913 when they sold the business to C H Pinson (qv). Established in 1898. 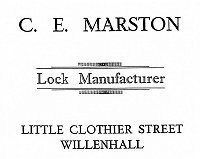 By 1914 the firm specialised in slot meter locks and boxes, M. and M. self-locking slot meter locks, M. and M. patent gas meter locks, shackle-less and double and treble-locking locks, company seal padlocks, book edge, expanding and loose-leaf ledger locks, folio locks, lever and Bramah hold-fast and safe-guard locks, differ, master and grand-master locks of every description, and fireproof, safe, cash, deed and seal boxes. In the 1980s the partners were T. Turner, H. Turner and E. Turner. When they died the son took over and only ran it for about 12 months. Closed in 1989. Started in 1825, to manufacture handmade, all brass, padlocks. These were sold under the "WARRANTED SECURE" and the "STAFFORDSHIRE KNOT" trade marks, later changed to "BULLDOG BRAND". Jack Morgan, who ran the business in the 1970s, was the third generation of the Morgan family to run the company. He was born in 1916 in the house in Regent Street from where the family ran the business. At its peak they employed 10 people. In 1983 the Thomas Morgan business was sold by its proprietor, Jack Morgan, to Richard Morton of W. J. Goodwin (q.v. ), who set up his son, Gary Morton, and his cousin, Peter, to manufacture the Morgan range of padlocks in the original Goodwin works at Wolverhampton Road, Walsall. In 1985 they started to manufacture traditional mortice locks under the Bulldog trade name and added cylinder operated mortice locks and rim cylinder night latches, together with locking bars and hardened chain, to complement the padlocks. Jack Morgan then set up R J Locks (q.v.) with his cousin, Ralph Jackson, in the original Regent Street premises. Jack Morgan died in 1996 and Ralph continued the business making one off special locks. Nothing is known about the maker. The Moss safe that can be seen in Hall 1, in the Rolfe Street Baths building, at the Black Country Living Museum, in Dudley. The safe plate that is on the safe above.